Here is the full view, photographed today on my back porch. So wonderful that the Japanese maple in the background is leafing out, too. Welcome to Week 13 of the Slow Flowers Challenge! 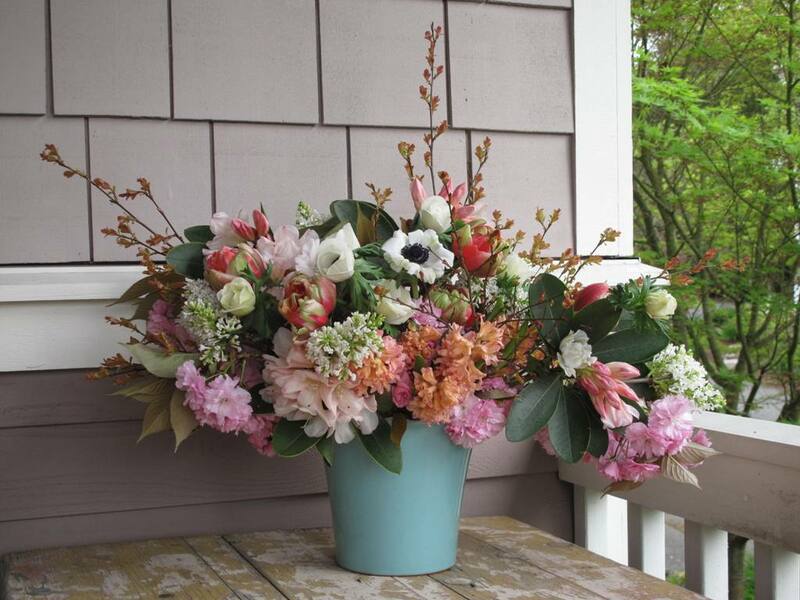 To be perfectly honest, it started with those yummy apricot-hued hyacinth and the very first fragrant lilacs of the season – both from Northwest fields. I love the soft, billowy generosity of spring’s early blooms – weed that right now after a winter of stiff conifers. And then I couldn’t take my eyes off of the most luscious of tulips, a two-toned pink and green variety called ‘Renown Unique’, grown by my friends Pam and Kelly Uhlig of Sonshine Farms on Whidbey Island, Washington. (You can find incredible fancy tulips and bulbs grown by them and other local farms at the Seattle Wholesale Growers Market right now). In addition, I came home with a bunch of the dark-centered white anemones, also grown by Pam and Kelly. All are quite lovely but I wanted to add some goodies from my own garden to enhance this week’s arrangement. You can see that the cotton-candy-pink flowering cherry branches and the pale blush-apricot rhododendron clusters — and the just leafing out apricot foliage of an old azalea add their seasonal sparkle to the farmers’ flowers. 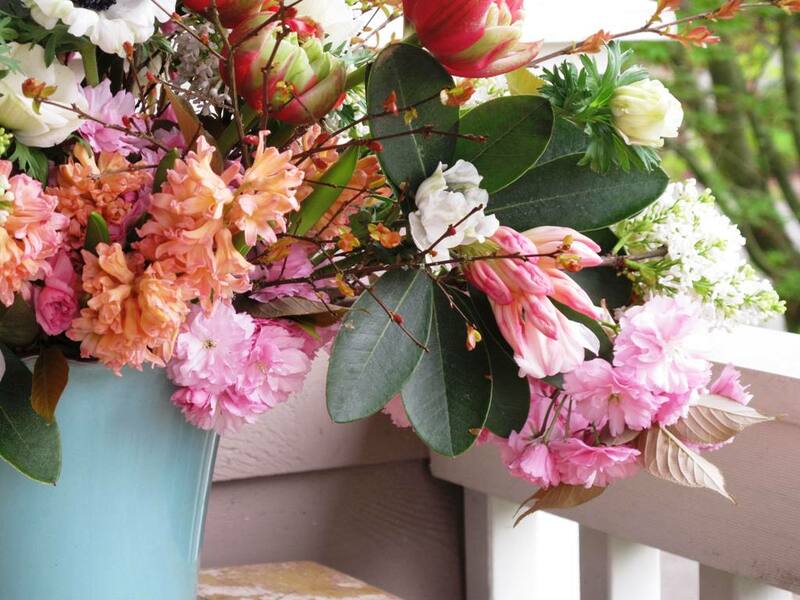 Combining gifts from the garden with gifts from flower fields is a good thing! My dear friend and San Diego garden TV personality Nan Sterman gave me this lovely pot for a birthday several years ago. 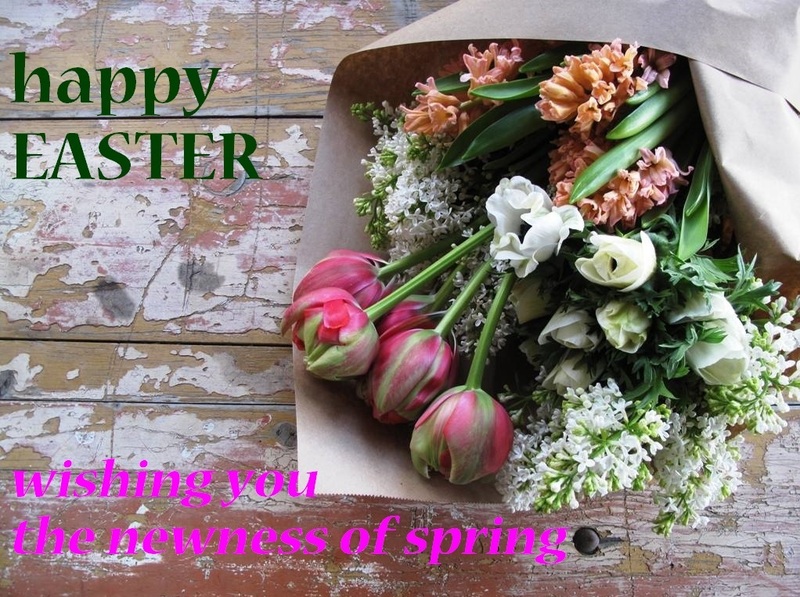 I’m using it for my Easter bouquet, but I’m sending her best wishes for a blessed Passover celebration that I’m sure she’s having with her family tonight.Our worlds continue to overlap and connect, especially when we love the garden, plants and nature. 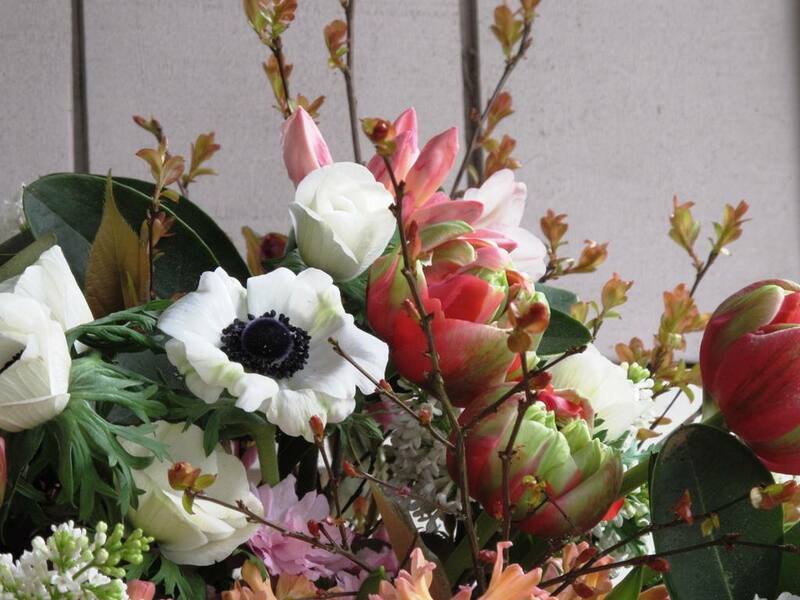 A close-up shows those tulips, anemones and the delicate azalea foliage. From my garden: Flowering cherry branches, rhododendron clusters (cut when most of the flowers are in bud, to encourage a longer vase life) and branches of just-emerging azalea foliage. This entry was posted on Friday, April 3rd, 2015 at 9:22 pm	and is filed under American Grown, Blog Posts, Creativity, floral design, Flower Farming, Gardening, General, Plants, Slow Flowers Challenge. You can follow any responses to this entry through the RSS 2.0 feed. You can leave a response, or trackback from your own site.